Hello Friends! I've recently heard a few teachers say how slowly the second half of the year drags on. I always think the second half goes by faster than the first! Maybe it's because my class is finally trained and working well together and independently! 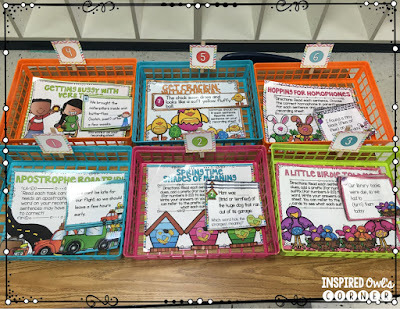 I have been excited about a few things we are doing in my classroom, and I wanted to share them with you! 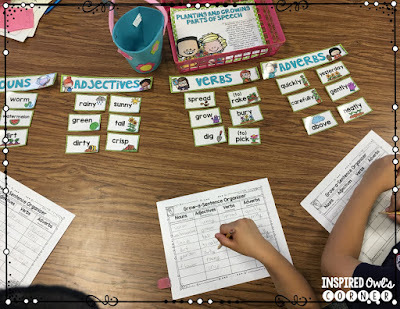 I've used literacy stations in a few different ways this year. One way I have used them is by having the students in numbered heterogenous groups. I've also numbered the centers with clothes pins as you can see in the picture above. I assign a responsible student to be in charge of the answer key for each group. Each group is rotated through a new center each day, so it's easy to keep track of which group needs to do the next activity. I have also had a parent volunteer work with the students who are struggling with a particular concept. This has really helped my struggling students. I have also use the same activities during my ELD time. We are required this year to spend an additional 30 minutes with our ELD students. (This year I have seven of them!) Some days we focus on reading, other days grammar or writing. 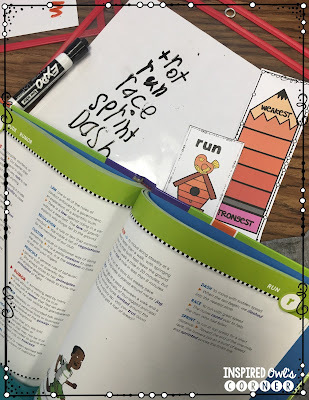 Shades of meaning was a difficult concept for them, but we practiced during ELD time, and they became my experts, helping the other students when I taught the concept to them. I have seen a significant improvement in my ELD students' progress this year! Something else I've tried this year is using the clear plastic white boards shown above that I bought from Target Dollar Spot years ago, instead of recording sheets. Not only does it save me time, money, and paper, but I am able to immediately see the students' responses. Each student is required to write an answer for each task card, so everyone is participating at the same time. This works especially well when the students work with a parent volunteer or me. Sometimes I do like to see the students' recording sheets when they are finished working. 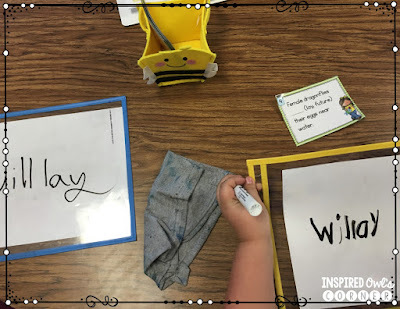 Do you have any other ideas or tricks you use for center/literacy stations? 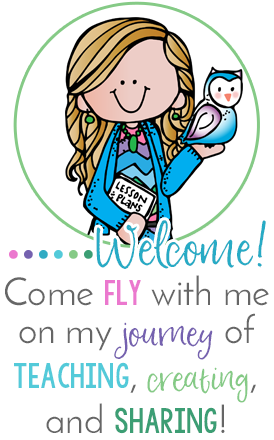 I would love to hear how you use them in your classroom! I wanted to share this FUN measurement activity we did on Friday. I really hoped that my measurement unit coincided with Easter this year, but we were able to finally complete this project! The students were placed in groups of five. Each group was given a measuring tape and a plastic hopping bunny. They recorded their measurements during five rounds of each person hopping their bunnies. I loved seeing them work as a team, each person helping to hold down the measuring tapes and the others determining the precise measurement. They did a great job! If you want to grab this freebie, click on the picture below. It also comes with measurement task cards. You can find the bunnies from Oriental Trading here. I have also found similar hopping frogs at The Dollar Tree in the toy section if you would rather use those. They work the same way as the bunnies. I love getting to the point in the year when the students can work independently. Everyone's hard work has paid off, and now it's time to enjoy our last few months before we have to say goodbye. I plan to make the most of the time we have left. 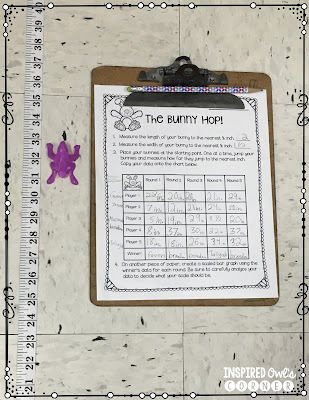 The hopping bunny measurement is brilliant! Thank you. Thank you so much Barbara! I thought my kiddos with sensory issues were going to have a hard time because it got so loud in my room, but they did a great job!